All right, so we understand that it's kind of cool to be able to active athletes on your studio preview shows during the postseason, because they're not playing anymore and don't have much to do. The Blue Jays' Vernon Wells was on a couple of days ago, and we enjoyed him, though it was odd to watch Peter Gammons — Christ, it's so good to have that guy back — talk about how much money Wells is going to make as a free agent this offseason as Wells sat there, doing everything he could to resist the urge to do cartwheels. 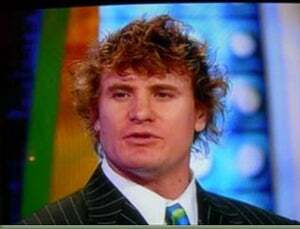 But ... we should probably talk about Eric Byrnes. As a ballplayer, we've always liked Byrnes, though a little of the scrappy hustle schtick goes a long way. And he doesn't sound any more foolish on television than John Kruk. But Lord, man: Nobody at ESPN has a freaking comb? Look at that guy! Not that we can particularly talk, but we're veering into Yahoo Serious territory here. With this and Barry Melrose on "SportsCenter" this morning, it was enough to make us long for the chin hair of Chris Duncan. We understand that Byrnes is a free spirit — as much as a "free spirit" as any professional baseball player can be — and that he was to, like, express himself ... but come on, you've already got him wearing a tie! We look forward to seeing if Encino Man is back on the telecast today; perhaps he just stick his head in a toaster and eliminate the middleman.